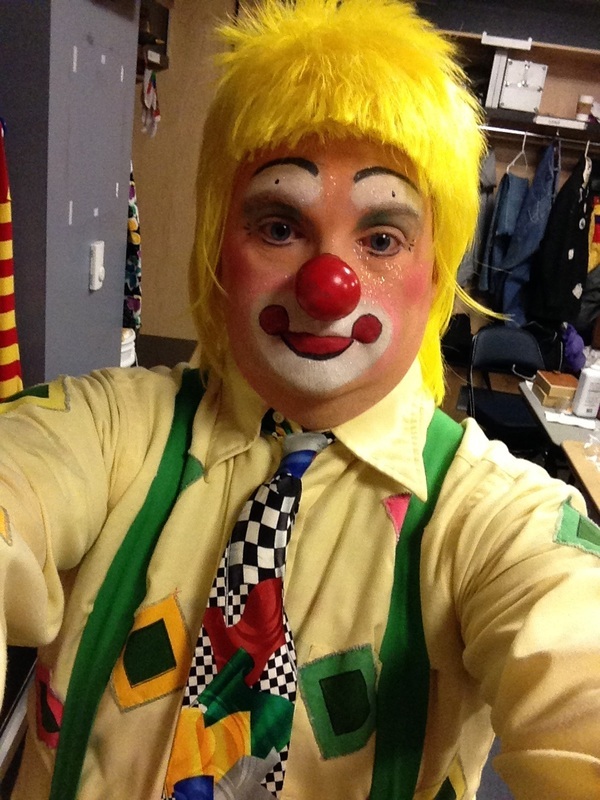 Sniffles has been a clown for 12 years with experience in Auguste, Whiteface, Hobo, Tramp, and Character Clowning. He would be glad to answer any questions that you may have. All clowns are not created equal. 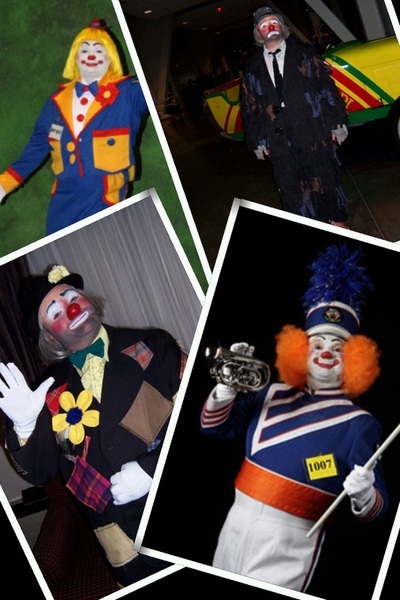 There are four basic types of clowns: Whiteface, Auguste, Hobo, and Tramp. While some folks may believe the Tramp and Hobo are the same, there are some distinct differences in the two, hence why I call them as such. Here is a brief description of each type of clown. Think about the look, the actions, and the type of clown you are wanting to portray when developing your character or characters. 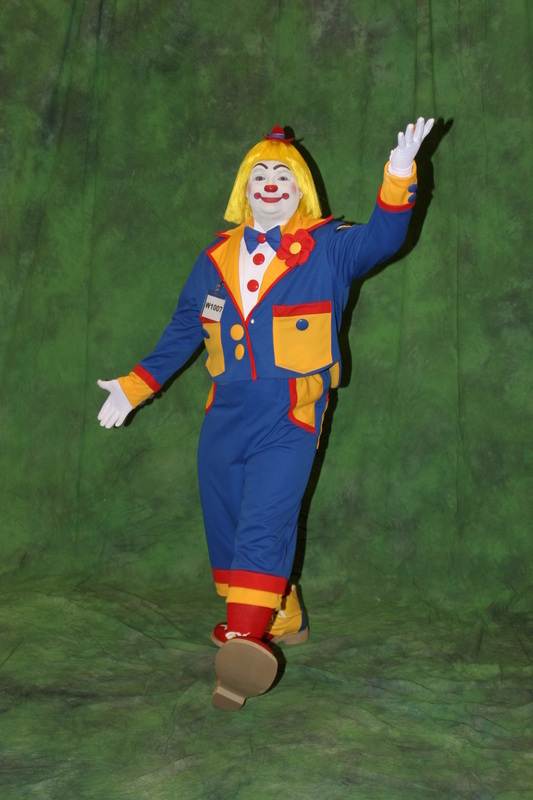 Whiteface - The Whiteface clown is very clean, pristine, and is more less the pretty clown. 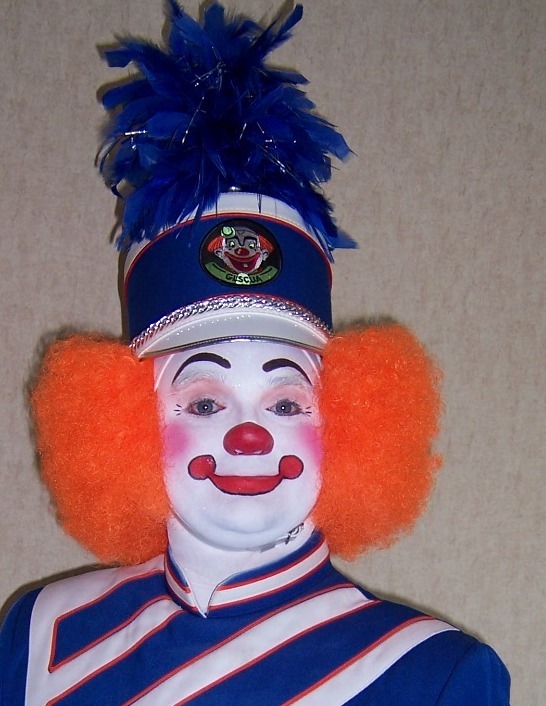 As a Whiteface clown, your makeup should be very distinct with clean cut edges for your eyebrows and mouth. All exposed skin should be covered in white (neck, face, etc...) so choose the appropriate wig and apply makeup accordingly. If you have a long thick wig you may not need to do the back of your neck. If you choose a short wig and your neck is exposed then I would recommend applying makeup to your neck. The outfit should consist of 3 basic colors typically solids and should not be too busy. Depending on the type of clowning you are doing you may deviate from this general rule. The general public is not going to know the difference but if you choose to compete the judges will. The Whiteface clown should never get dirty, fall to the ground, or be the brunt of jokes, basically they can give a pie in the face but not take a pie in the face. 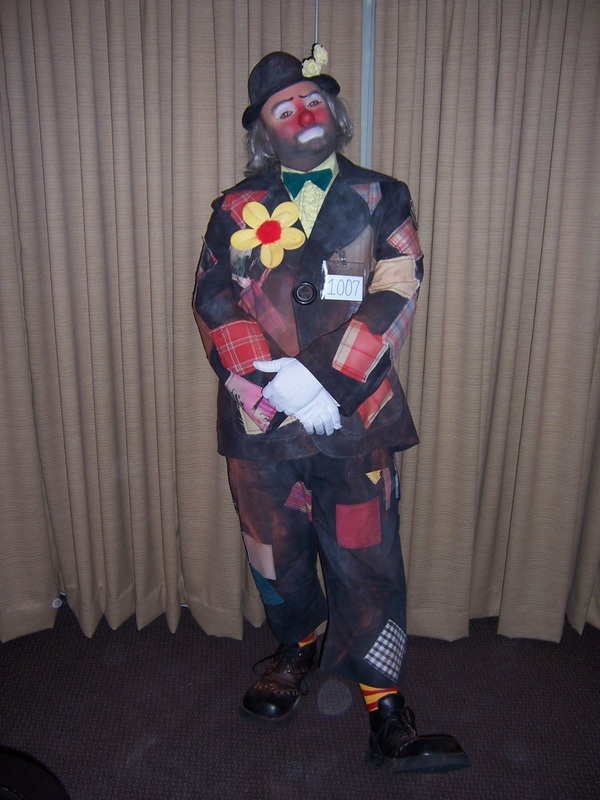 Auguste - The Auguste clown is the silly clown and typically the prankster of the group. The makeup will have both distinct lines as well as blending. Auguste clowns will use a flesh tone base with a mouth, muzzle (typically white) and eye make up. Some clowns prefer to have outlines around their muzzles and eye make up where as others choose to blend. This is entirely up to you as to which style you prefer. The outfit can consist of polka dots, plaids, stripes, solids, or a mixture of the patterns. Although you want to use good taste and not create a costume that is too busy, you are not held to the 3 basic color rule that is seen in Whiteface clowns. The Auguste clown can take a pie to the face, get dirty or fall to the ground, typically when they try to give a pie to the face, it usually backfires. Happy Hobo - The Happy Hobo along with the Tramp are the All American Clowns. Originating from the depression era when times were tough, and Americans were down on their luck. The Happy Hobo and Tramp clowns now bring smiles to many. The Happy Hobo is a happy go lucky clown, using flesh base makeup, white eyes and mouth, and typically incorporating a beard. The makeup style can be a clean defined line for the eyes, mouth and beard or a more blended look. This is up to the individual and style preference. The beard is not only for facial hair but for dust and dirt, the white resembles where the character would wipe his mouth and eyes. The Happy Hobo outfit will have patches and stitches holding it together but is not ripped and torn. The appearance should be that the outfit was damaged and fixed with what was available. You can add character to the outfit by using baby powder or dark powder to add the effect of dust to the outfit (as if the Happy Hobo was sleeping in a box car or under a bridge) The Happy Hobo should portray the type of character that is down on his luck but looking to improve his situation, so the appearance is such to be able to get that next opportunity to make a living. This is the clown that had it all and lost it but is Happy about life. 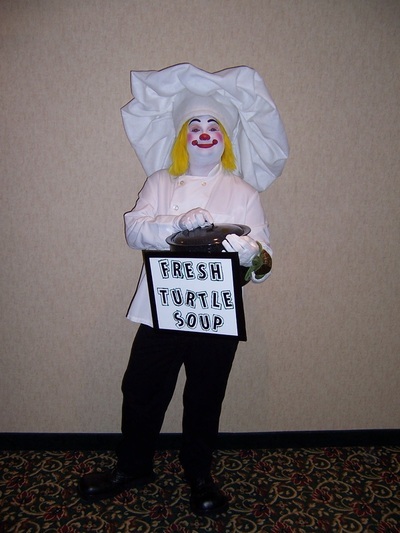 He is often the brunt of a joke of a Auguste or Whiteface clown. Tramp - The Tramp is also an American clown. Much like the Happy Hobo the the character originated from the depression era when times were tough. 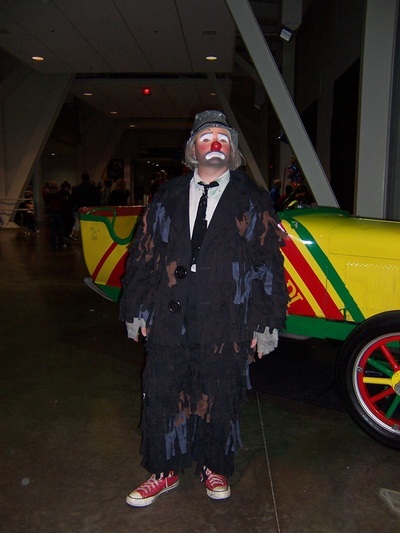 The Tramp clown uses flesh base makeup with white around the mouth and eyes (this represents where the character would wipe his mouth and eyes). The beard is also a dirt line not just a beard. The edges of the makeup can be distinct or blended depending on the look you are trying to portray. The Tramp outfit is tattered and torn and in disrepair. Again dusting can be used to create a more weathered look. There is no attempt to better his situation and he is looking for the next handout. This is the clown that never had anything and never will. You will have to determine your audience when selecting how closely you follow the above guidelines. For example, when performing for a public appearance you may be a Tramp or Hobo clown that is very clean, but in competition you may select to dust your outfit and be more particular. This goes for Whiteface and Auguste as well. 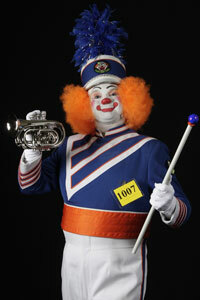 I know several Whiteface clowns that prefer to use plaids, while the public does not care a judge in competition may. So know your audience and prepare accordingly. Thanks for visiting and Bump a Nose!